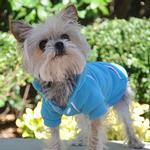 Sport Dog Hoodie by Doggie Design - Blue Curacao Customer Photos - Send us your photo! Sage is going to be stylin' this winter in his new hoodies! He's 55lbs, 28"ish chest and the XL fits perfectly! Zuzu, our 5 1/2 month old female teacup poodle thinks girls don't have to wear just pink! 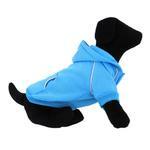 She loves her Sport dog hoodie in Blue Curaçao. Bubba is a very energetic little guy who is 1 1/2 years old. He just got a new little sister who he just loves. I love him very, very much. Houdini looks awesome in his Doggie Design Hoodie. Hes wearing his Blue Curacao Sport hoodie with white snap at neck, white piping trim plus Logo on pocket while reading the newspaper with chew toy in his mouth. Posted On 12/13/18 by Brandy B from Mt Vernon, OH Yes, Brandy B recommends this product! Posted On 11/19/18 by Brandy B from Mt Vernon, OH Yes, Brandy B recommends this product! Bought for my big boy. Color is nice with his grey fur and chest fits perfectly but a little long on him. Posted On 10/17/18 by Heather P from Nova Scotia Canada, Yes, Heather P recommends this product! This hoodie is adorable. It is a little large but would rather it be a little big than too tight. Posted On 10/11/18 by omaha from omaha, AR Yes, omaha recommends this product! Posted On 10/11/18 by M&T from IGH, MN Yes, M&T recommends this product! The is amazing material it is not a fleece outside and it is very soft. Great fit. Posted On 08/23/18 by Monica G from North Jersey, NJ Yes, Monica G recommends this product! Awesome sweatshirt for the price! Sizing chart is very accurate on this product! Posted On 07/19/18 by Leanne T from , MA Yes, Leanne T recommends this product! Posted On 12/10/17 by Deni S from New York, NY Yes, Deni S recommends this product! Got this in an XS when my poodle was a little under 3lbs but now she wears the small Now that she’s 3lbs. It’s a basic hoodie that looks very cute on. I love these hoodies. They fit great and look great. Loki loves them too! Posted On 03/19/17 by Joyce B from Springfield, MA Yes, Joyce B recommends this product! I love this hoody. They do run on the large side. I ordered a medium but could have really used a small. But they are well made and worth the money. Posted On 07/19/16 by Stacey Z from Fresno, CA Yes, Stacey Z recommends this product! It was made really well and super soft . I purchased this for my 3.5 lb chihuahua and it's a perfect fit. It's soft and warm and the hood doesn't cover his eyes when it's up.On a cold day there's even room for a tank top underneath. 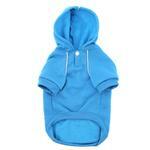 Hoodie is excellent quality and keeps my small dog comfortable. Posted On 03/31/16 by Karen K from , CA Yes, Karen K recommends this product! Cute sweatshirt. My puppy looks so cute in this. Posted On 03/26/16 by Deni S from NY, NY Yes, Deni S recommends this product! Cozy and substantial hoodie. Nice and cozy. Snap in the front helps with slipping it on easier. Posted On 03/23/16 by Nancy P from Florence, OR Yes, Nancy P recommends this product! Our two girls now have this hoodie in pink, red, orange and bright blue. They fit great and are well made. The only problem is that the red one that is the oldest is very "pilly". I've shaved it twice but it is really bad, which is why we bought two new ones. I like BaxterBoo but try to get items on sale or when the shipping is free...otherwise the shipping seems high. This is such a nice shade of blue. I purchased this for my little man Chulo. Love this color on him. These hoodies are very nice. There were so many nice colors I had a hard time deciding which colors to purchase so I purchased a few. Posted On 03/18/16 by Deni S from New York , NY Yes, Deni S recommends this product! Great cozy thick hoodie. Also have it in pink. The XS fits my 2.2lb teacup poodle very well. Posted On 03/16/16 by tonya s from Oriental, NC Yes, tonya s recommends this product! Posted On 03/14/16 by connie b from waynesboro , VA Yes, connie b recommends this product! Posted On 03/14/16 by Ann H from Glendora, CA Yes, Ann H recommends this product! Posted On 03/13/16 by Beth R from Dayton, OH Yes, Beth R recommends this product! Fits great on my Mexican Hairless Yoda. The color is perfect. Posted On 03/11/16 by Joanne T from Toms River, NJ Yes, Joanne T recommends this product! One of my favorite colors and Perfect all year long! I love the quality, fit, easy on/off design and all the beautiful color choices. Great protection in chilly spring and fall and cold winter days. 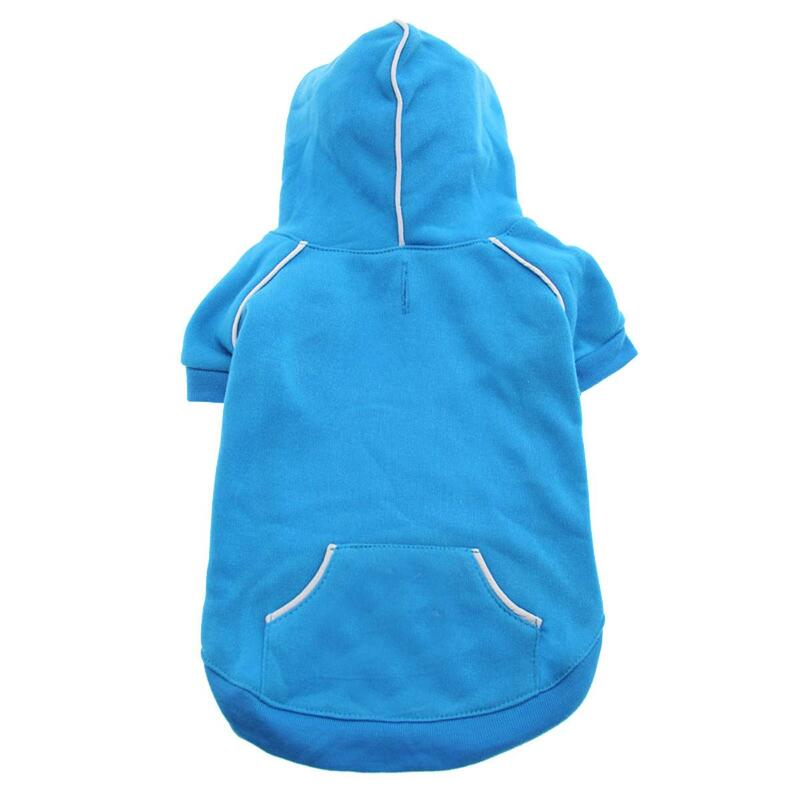 I recommend this soft comfy hoodie to all pet owners looking for a comfortable functional stylish solution that your pet will enjoy wearing. Posted On 02/20/16 by BF from Canada, Yes, BF recommends this product! Posted On 01/29/16 by DEBRA S H from Ripley, WV Yes, DEBRA S H recommends this product! This hoodie is made really well and is cute on; however it does run small. I ordered a medium, and it fits my Havanese like the small sizes I was trying to replace. I ordered Zack & Zoey and other brands in size medium, which all fit well. Otherwise this is a good shirt, just order 1 size up. I purchased 2 of these. One for each of my dogs. They are excellent. Just the right weight. Fit beautiful. Color is so pretty. My dogs look adorable in them. Love them. Posted On 12/16/15 by Marijo L from Mason, MI Yes, Marijo L recommends this product! Posted On 12/09/15 by E E from , WA Yes, E E recommends this product! cozy & warm, my little guy keeps warm from drafts with this. Posted On 12/08/15 by Nancy S from Myrtle Beach, SC Yes, Nancy S recommends this product! Looks so cute on my 8 lb. yorkie (size small). Very warm (fleece lined). Posted On 12/07/15 by Angie J from Arlington, TX Yes, Angie J recommends this product! This is a very nice and well made hoodie. The material is soft and thick. The snap at the neck is perfect for dogs with thicker necks, like pugs. It gives that little extra bit of room on the neck for the hoodie to be comfy. My male pug is 22 lbs and I ordered him a large. It fits loose and comfy on him. The leash hole is a must too! Posted On 12/06/15 by Lori L from Gastonia, NC Yes, Lori L recommends this product! Puppy approved soft hoodie. Good looking, soft fabric, quality product, sturdy construction. Very pleased. Posted On 12/06/15 by Sheila H from Dalton, GA Yes, Sheila H recommends this product! Posted On 12/04/15 by Caitlin from , Yes, Caitlin recommends this product! Posted On 12/04/15 by Terri H from Los Angeles , CA Yes, Terri H recommends this product! Posted On 12/04/15 by Judi W from Decatur, IL Yes, Judi W recommends this product! Very cute Hoodie that is made well, but runs on the small side. Posted On 12/04/15 by Julie M from Decatur, IL Yes, Julie M recommends this product! Very cute, soft but durable hoodie. Well worth the money. Easy to get on and off. One of my favorite hoodies I have bought. Posted On 12/04/15 by Susan H from Las Cruces, NM Yes, Susan H recommends this product! This hoodie looks so adorable on my poodle, Sunny! He just loves wearing it even with the hood all the way up. He actually prances down the street like he is showing it off. Because of the way standard poodles are built , I was afraid it would not fit him well , but it fits him pretty well. It is a little big in the tummy area when he is walking and running , but perfect when he sits down or lays down as it gives him plenty of room to move around. We keep him in a very close puppy clip so he gets cold easily and this is perfect for those cool afternoon and cold evening walks . It also arrived really fast. They said it would take approximately seven days and it arrived in three days. Posted On 12/02/15 by Carol S from Knoxville, TN Yes, Carol S recommends this product! This looks gorgeous on my buff-colored male Cocker Spaniel. It also matches his collar which is a blue/turquoise "bone camo" print. It was a good purchase at a great price! Nice and warm although my little guy fights me putting his legs in the sleeves. Posted On 11/29/15 by whatyorkie from toocold, CO Yes, whatyorkie recommends this product! I bought this Sport Dog Hoodie in Blue Curacao for my 13 lb Yorkie and the medium fits her perfectly! The aqua blue color looks great on her and she's nice and warm while in the house and for quick runs outside in the snow to do her business. Well made, quality fabric and styling at a good price on BaxterBoo makes it an awesome purchase! And my husband said she looks so cute and sporty in it! Posted On 11/29/15 by Jennifer B from Saginaw, MI Yes, Jennifer B recommends this product! This hoodie is cute and sporty. It will keep my dog warm in cooler weather. Posted On 11/28/15 by Alex from Seattle, WA Yes, Alex recommends this product! The material is super soft and thick. Its perfect for chilly days. Posted On 10/07/15 by LisaDawn from Olathe, KS Yes, LisaDawn recommends this product! Very nice sweatshirt. Well made, delightful colors. Read the sizing chart as these run smaller than normal - you don't want to be disappointed! Posted On 09/30/15 by mariza marez from amarillo, TX Yes, mariza marez recommends this product! Posted On 11/25/14 by Karen M from , OR Yes, Karen M recommends this product! I bought this for my son's Pitbull and it is very nice. We ended up ordering XXL due to the measurements for his chest and neck. Which, it was good we did. It fit fine there but is a bit long. We will just shorten it up some and keep it. He loves being cozy. Posted On 10/17/14 by Tiffany B from West Milton, OH Yes, Tiffany B recommends this product! It is very cute! Love the color on my dog, and it fits him very well. Very great product overall! Posted On 10/08/14 by Lynne P from , MN Yes, Lynne P recommends this product!